Like I said Monday, M took the girls on a daddy-daughters trip last weekend. I had the place to myself! I didn’t want to waste time so I actually made a plan. No sewing (well, almost), no knitting, nothing that I can easily do when the girls are around. I made a list of possibilities : dyeing, patchwork (technically something I could do when the girls are here but not something I ever get around to; besides, I could fit it in in segments while dyeing), and felting. It’s only three things but it was still too much. Felting got cut. First up, white fabric got dyed. 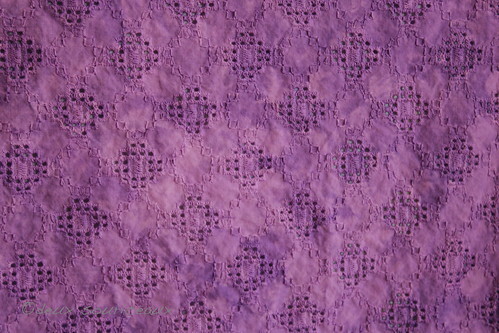 It’s this gorgeous cotton that I used to make a blouse. 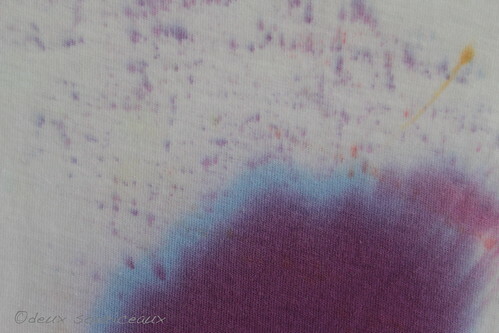 I used violet reactive dye in 3% concentration. The color is beautiful but I screwed up a little. 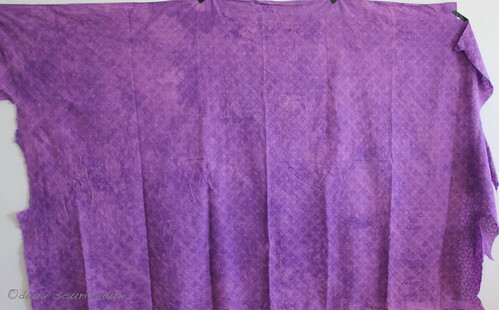 I moved the fabric around each time I added salt to the dye bath and once more when I added the soda ash. But then, I completely forgot to move it during the final 45 minute soak so it didn’t dye evenly. The real life color is somewhere between the top and bottom pictures. Maybe closer to the top. I’m not sure what I think of it. I love the unevenness of kettle dyed yarns and this definitely has a similar look. I think it’s the way it competes with the texture of the eyelets. Eh, I can make something for the girls. They’ll like it, mottled color and all. While that fabric was soaking, I started sewing up strips from a jelly roll I had and some leftovers from another one. 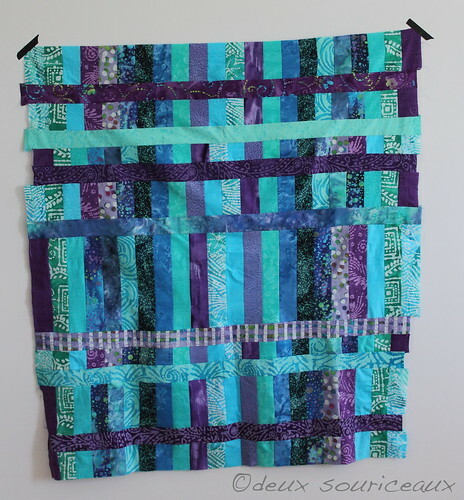 Both rolls were all batik fabrics, the full one in shades of aqua/turquoise and the partial one in shades of purple. When I had enough strips sewn together to be roughly a square, I cut it up into strips the other way. I switched up the width of the strips for fun. And also because my strips weren’t perfectly cut and my sewing wasn’t perfectly straight so a checkerboard pattern wasn’t going to happen. I sewed the pieced strips back together with uncut strips in between. And got this! I loved it so much! (Notice the past tense.) I was hoping to have enough for a circle skirt for E and I did. I made it yesterday and it hurt a little to cut into my beautiful pieced fabric but the skirt is awesome. You’ll see next week. 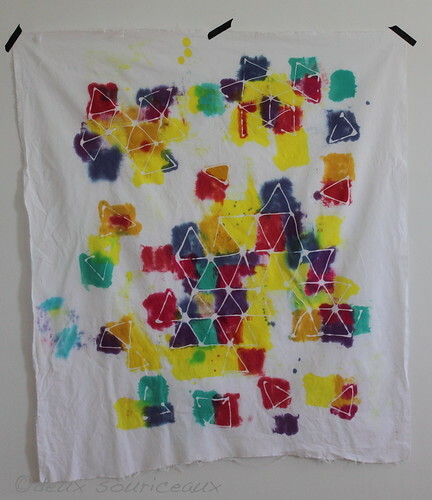 There were a few dyeing/fabric painting techniques I wanted to try. One of them was bleach. 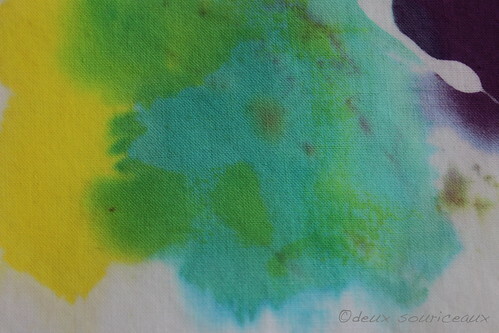 I wanted to do a tie dye effect and a bleach drawing on fabric. Only when I got around to it, I realized I needed something to stop the bleach. One or two places suggested vinegar and one or two places said vinegar would create toxic fumes. Not risking it. However, I’d bought this discharging product when I went to get more soda ash on Saturday so I tried it. 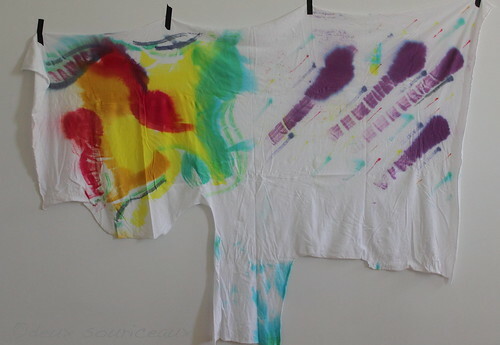 You apply it, wait for it to dry and then iron the fabric and the dye lifts! No bleach! 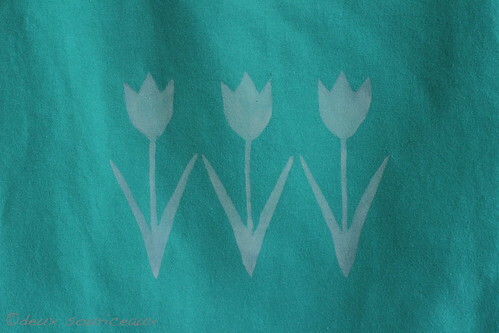 I tested it on my fabric and it worked well so I went ahead and made some freezer paper stencils. It looks better in person. Not as white as my sample. Maybe I used less gel on my tulips than I did on my test. 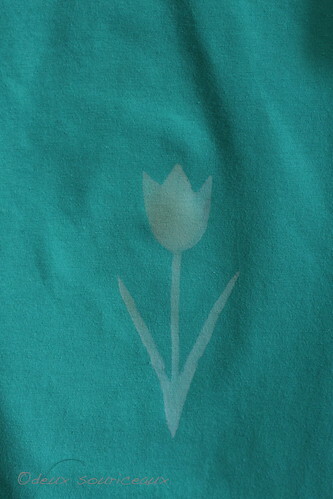 And I think I may have slightly burned the fabric on one of the tulips because it turned a little bit yellow. It’s less obvious in person than in the picture. This became a top for V.
Finally, I did two fabric painting tests. I really wanted to do batik and I actually have the equipment but I don’t have a good way to keep the wax warm next to a working surface. I used the blue gel glue technique instead (it’s kids’ glue). But then, I saw that it dissolves in water so I was going to have to paint the fabric instead of putting it in a dye bath. I still want to do that. Must find a way to use the wax… Because I don’t have fabric paints, I was going to have to use the reactive dyes to paint. I soaked two pieces of fabric in a soda ash solution. One I kept wet and one I dried. I’ve had purple food coloring do that too… I plan on using bits of it as accents in other projects. 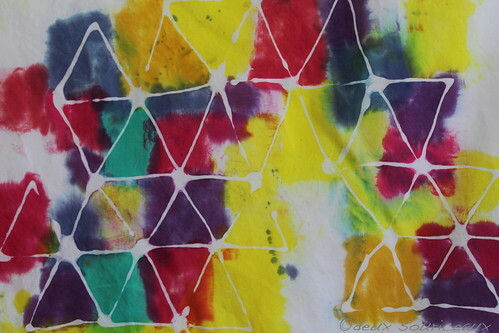 For the dry one (woven cotton), I made some triangle designs with the glue and let it dry overnight. Then I painted in vaguely square/rectangular shapes on top. I originally wanted to paint the whole thing but I was afraid it would get muddy with such intense colors. I was sure I would hate it. And I love it so much! As much as that pieced fabric. When I washed the fabric after letting it set overnight, it was less intense. I think the fabric had absorbed less soda ash than the jersey so less of the dye was actually fixed to the fabric. It is perfect. Ooooohhhh, loving your dyeing! The violet dyed cotton is so nice — I love the kettle dyed yarn look too and can definitely see the similarity in color distribution. But my favorite is the panel you made using glue as a resist — it’s fabulous! Check out Gillian’s Sewing Dares post because I’m going to post a dare for you :D! Thank you! I can’t wait to get to work on the dare you gave me. I’ve been curious to try batik too. I wonder if one of those mini-crockpots would work for melting the wax? I like what you did come up with though! Thank you! I can’t wait to show the skirt off either. I’m hoping I can get a T-shirt done to go with it first. I’m thinking just a plain white T-shirt with some sort of appliqué in my leftovers but I’m not sure. The one thing that bothers me with the mini crockpot is temperature control. I’d want to get the wax at the exact right temperature, you know? Maybe there are some that allow that? I also saw a potluck kit at the grocery store that seemed interesting. It was just an aluminum pan with a stand and one of those gel burners. Then again, we are planning on doing some kitchen renos and when I get my new kitchen, I should have the space to spread out close to the range. Then, all I would need is a small saucepan for the wax. True, the mini crockpots aren’t the best for temperature control… at least, not the ones I’ve seen. That renovation should help though!